What comes to mind when you think about your local park? Perhaps it’s a baseball diamond or a swing set, maybe the perfect spot for an afternoon picnic. What about wildflower meadows, pockets of forest, mud pits, or areas for shelter and fort building using sticks and logs? For neighbours in two Kitchener, Ont. communities, that’s exactly what they imagine. Evergreen’s Neighbourhood Nature Play program is a partnership with the City of Kitchener and community groups. 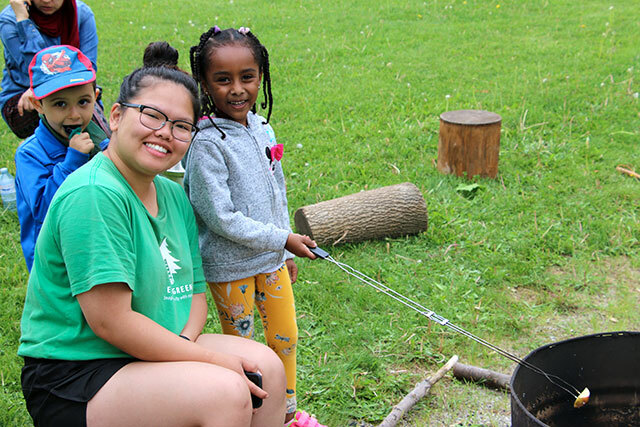 It brings Nature Play and Park Animators into Gzowski and Kingsdale Parks, encouraging children to explore the outdoors, use their imaginations and have the freedom to be the architects of their environment. They can explore, invent, and build things using their own creativity and problem-solving skills, all while developing an appreciation for the natural world. Zack Stevens, who began as Lead Animator and now is the Project Lead, has seen the transformation in children since Neighbourhood Nature Play began in spring 2017. But it’s not just the children that are seeing changes. Zack says parents have found connections with one another and the program is helping to build a community in these parks. Zack says the hope is that these parents feel empowered to lead Nature Play with their kids outside of the programming hours in the park. 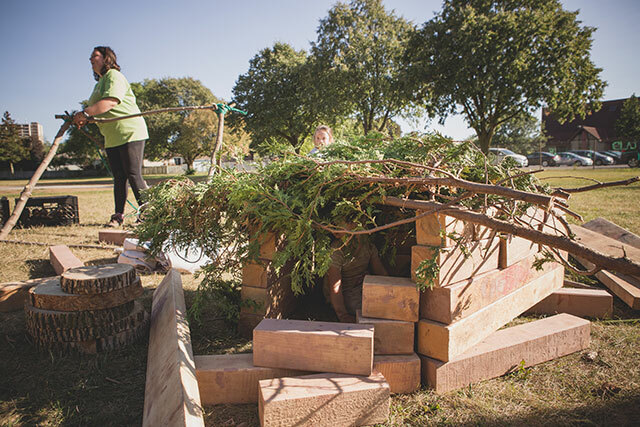 Just this past summer, Nature Play animators led a workshop with parents to build their capacity to take part in this valuable type of play more often. In August, the City of Kitchener has begun the physical revitalization of the parks, incorporating more permanent structures and features that will help encourage children and their parents to participate in the risk taking, nature-based, loose-parts play Evergreen animators have been leading. Even Kitchener residents who don’t directly take part in the program are seeing the benefits. Kingsdale Park is bordered by a neighbouring retirement community. A resident of this community has told Zack that it’s been amazing to see the park transformed. Do you want to see what it’s all about? Stay up-to-date on when programming returns to the parks by following Neighbourhood Nature Play on Facebook and learn more about the program on its project page. Thanks to our partners at the City of Kitchener, and the Lyle S. Hallman Foundation, Hain Celestial and the Ontario Trillium Foundation for supporting Neighbourhood Nature Play.